i am happy and confident enough in my scribblings to be thought of as parochial. i might just qualify that by pointing out that i have been a vociferous negator of such a practice on an hebridean island that seems mired in the folly; in fact, i have all but made it my life's mission to put a stop to any business or organisation with the word islay in its name, from using a map of the isle in the almost inevitable logo. aside from demonstrating the arrogance of an incomer (which i still am even after twenty-five years of hebridean domicile), there is good reason for my damning of the practice. after having resided here for only a year or so, i was cordially invited to join the committee of the local islay festival, or feis ile as it is more romantically known. this is a festival that has all but been subsumed by the island's annual whisky festival, one which has more or less adopted the gaelic epithet as advised above. at that time, each member of the committee was required to take on a particular role, for which they would be solely responsible, and given my background in design along with the pretence of being able to write in proper sentences, i elected to be the provider of publicity and copy for the local and national press. as many a press release, even to this day, is less than memorable amongst a whole slew of forgettable press releases, i opted for a slightly different approach that contained my words and information within the confines of a printed card, the outer cover bearing the festival logo. this latter graphic consisted of (and pretty much still does) a triangle comprised of celtic knotwork surrounding a (i know you saw this coming) map of islay. the so-called press release was sent out to many of the national newspapers in the hope that they might include our events in any festival roundup they may deem appropriate to feature in their esteemed publications. now this was so long ago that the memory is a tad foggy on the specific details, but i think it either the guardian or daily telegraph that responded in the affirmative with regard to inclusion in a future feature, but at the same time, enquired as to just what the green splodge midst the celtic triangle might be? it was at that point that my reaction to inherent parochiality took one step forward. those of us who live on islay are well aware of its topographical and coastline delineation, but for reasons that are hopefully glaringly obvious, no-one else held the same recognition. hence the splodge. therefore, should an island business or organisation be proffering its services or wares to the indigenous, what purpose was served by incorporating a map of the isle? and should the same purpose be cast further afield, again, why bother; no-one has a clue as to why that particular graphic has been included. however, in the face of globalisation, something regularly practised by the major sponsors of professional cycling and actively encouraged by the tainted governing body of the sport, a discrete level of parochiality cannot possibly be seen to go amiss. in the world of rapha condor, sharp electronics are no more. having been well-satisfied by their three years in black and pink, they have moved their sights to more international horizons and pitched their colours on the jerseys of jonathan vaughters' garmin team. as sharp uk's jasper credland wrote me on a postcard 'end of an era, brian'. however, little stands still in the world of high speed cycling, no matter the perceived level of competition, and that includes the financial aspect of putting a team on the road for at least a season or two. thus moving smoothly in to replace the departing electronics giant is the london based jardine lloyd thompson group, an international group of risk specialists and employee benefits consultants which, if i have correctly unravelled the formalities, means insurance and pensions. and here is where the protected parochiality is allowed, nay encouraged to surface. 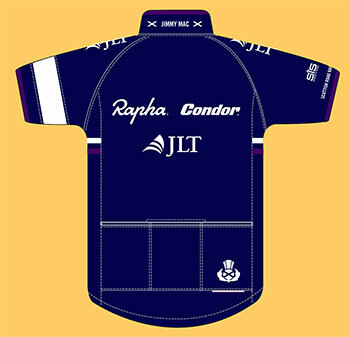 rapha condor club president, charlie pearch did a modest degree of digging into jlt's past to discover "JLT is actually owned in major part by the conglomerate Jardine Matheson, whose founding partners were two Scotsmen in the 1890s". we are now on sure-footed ground, for two of the rapha condor stalwarts from the 2012 team have re-signed for 2013; kristian house and the inimitable jimmy mccallum. the latter, as i have been at pains to point out perhaps just a bit too often, is the undisputed king of scotland. in other words, jimmy is the current scottish road race champion, and it seems no less than he deserves that this title be observed in the peloton. thus it is that the latest rapha condor jlt jerseys, which follow the age-old team formula by adhering to black, pink and white with minimal advertising, have now encompassed a variation on a theme. the jersey that will be worn throughout at least the early part of the king of scotland's season has replaced black with the dark blue of the scottish flag. 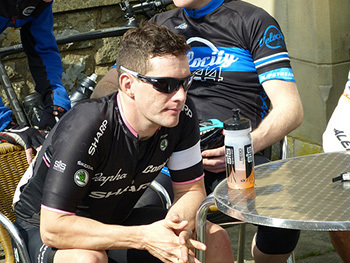 subtlety has been the rapha condor watchword from the get go, and jimmy's jersey is no exception. allied to the tartan lining on the inside of the collar, there is a white thistle graphic on the rightmost rear pocket, while the pink edging on the sleeves and on the side panel flashes have been replaced with heather purple. though i have reproduced here the design drawings for jimmy's jersey, the man himself is "actually in possession of the very jersey you may have seen the graphic of." personally, i have never come across any other professional team that has provided a scottish road race race champion with a specifically designed jersey. dressed thus, does he intend to ride at the front of the peloton all season? "Over the past few year I've never actually seen a properly issued or well thought-out Scottish champs jersey, but one cool aspect is that i also get to wear the same design on the road and in the crits I'll be doing in 2013. Pretty sweet I'd say." for those of you who pass periods of your spare time watching jeremy powers' 'behind the barriers' series, racing for another rapha sponsored team, it has perhaps come to your attention that jpow seems to possess a whole wardrobe of giro helmets decorated with american national graphics attesting to his position as america's national cyclocross champion. now endowed with a tartan and thistle emblazoned jersey, will jimmy augment his own headgear with an appropriately embellished helmet? "Not sure about the helmet situation as I'm led to believe we are due to change helmet suppliers. However, I like your JPow comparison, but I feel I must declare my inferior talent in that area. It would be cool but I'm not sure. However I can always do my own bit of modification if I can do it well." though i think mr mccallum may protest too much when comparing himself to jeremy powers, he is a rider who has been known to indulge in some cyclocrossing all of his own. in fact, he was due to have participated in the recently cancelled scottish cyclocross championships in irvine (cancelled due to bad weather?) with this in mind, i asked whether an appearance at dig in at the dock in bo'ness on january 6th, might conceivably be the first public outing for his new jersey? "Dig in at the Dock unfortunately is a cross race and a TLI event at that, so I'm not sure my jersey would be relevant." 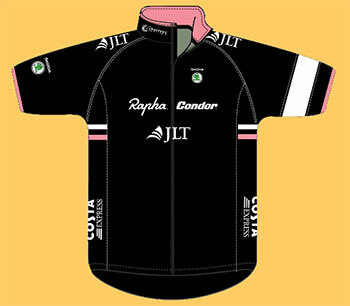 other members of the rapha condor team in the past have been wearers of championship jerseys: dean downing in the national criterium jersey and subsequently kristian house in the british national road race champion's jersey. if i recall correctly, replicas of both jerseys were available in rapha's online shop not too long afterwards, that fans of both riders could avail themselves of a similar look, though obviously without the speed benefits. therefore, it seems only fair that, in order to continue our hard-won parochiality, that we be offered a similar north of the border opportunity. 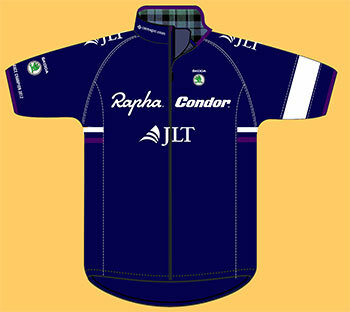 is it likely that there will be jimmy mac rapha jerseys for sale in edinburgh's ronde next year? "The idea of it being on sale is a cool and pretty humbling thought, however I'm not sure there would be enough demand." this man is way too modest. many have paid tribute to the notion that cycle racing is as much attributed to the rider's state of mind as it is to his level of fitness. clad in a jersey that acknowledges jimmy mac's scottish superiority on the road means one of those boxes has been clearly ticked before the season begins. there has been no change in the rapha condor philosophy since the beginning of the 2012 season; the team will continue to be a development vehicle for up and coming young professionals, creating a platform from which they might conceivably move to a continental career. and as an adjunct to jimmy's mention that the team may be changing helmet supplier for 2013, they have also chosen to decorate those italian built condors with campagnolo groupsets and wheels. with the recollection of my recently published article about 'made in scotland' and vague comparisons with italian style, my heightened sense of parochiality is now complete. don't you just love it when a plan comes together?